হক সাহেব, আপনি অনুগ্রহ করে ছেলে হিসাবে ডালিমের উপর কোনও কিছু চাপিয়ে দেবার চেষ্টা করবেন না। He is much more matured than his age. Whatever you all had said before leaving Libya is the only way now to unmask Gen. Zia’a true color and there is no other alternative. At present his unholy power politics can only be frought politically, it is not possible to oust him from power now through any armed conflict. I and Faruk have realized that. Such an political initiative can only be taken by you all. Should you have any such thinking then we are ready to work to gather. We have no dout that both of you are patriots and that is why we agreed to organize both August and November revoulutionary uprisings together. Your desire to work together in any political initiative that we might consider to undertake in future is also commendable. But whether your proposal would be acceptable or not that would be decided only after the issue is discussed amongst all concerned. But to take any such initiative from of the state power one needs different kind of help and assistance. Particularly, substancial amount of financial assistance which can’t be arranded from within. This can only be got from the friendly leaders of rich countries who would be convinced in our cause which would serve the mutual interests. In our political initiative Moammar can be the most trusted ally and conduit to get us introduced to other like minded leaders besides, providing required financial assistance. We are aware that even you get required assistance it would be difficult for you two to get into politics alone without us. Therefore, once we decide, I suggest you to arrange a tripartite meeting to present our case and discuss in details the modalities. Very well, then we shall be waiting for your decision. Meanwhile. On my return, I shall apprise Moammar about our meeting and convey your proposal about the meeting. Thus, our meeting ended and Rashid went back. Within a few days our decision was conveyed to Col. Rashid. In reply Col. Rashid informed that Col. Gaddafi had responded positively and had expressed his desire to organise the tripartite meeting as soon as possible. within a short while the meeting was arranged. After a thread bare discussion Gaddafi agreed to perovide all kind of necessary help including financial assistance that is initially required. Besides, he also promised to introduce us with other revolutionary leaders of different countries whom he considered as his trusted friends. This was a exeptional guesture indeed! Soon after this meeting we had been meeting clandestinely at various convinient vanues as and when required for moving ahead with organizational activities to form a political party alongside carring out our deplomatic responsibilities. With the wide acceptance of our ideals, principles amd menifesto by the people and their support our organization was growing much faster than anticipated. Zia was in dark about our such activities. But he knew one thing very clearly that his popularity was erroding gradualy within the armed forces as he decided to leave the right path and trodd on the wrong path. Questions are also being raised among the people about his self invented gimics for his immage building endevor. All sounds good. Nimmi would be here to take care of the family and my absence would make no difference in your visits as you are well known to the Chinese leadership. But Sir, please do understand it would be very embarrassing for me to cancle the trip. So, I must take the tour. Thus we finished our conversation. Yes, I have said so and had also explained the reason to Gen. Zia. No, you must cancel your tour and must sit with the President for discussion. Take it as my order. He personally told me in confidence that it is of utmost importance to hold discussion with you during the visits. Shrewd Gen. Zia had used Abba to comple me to hold meetings with him for discussion. After talking with Abba I was undone and had cancelled my tour and remained in Piking waiting for his arrival. It is needless to say that I was keeping other comrades informed about all that had been happening concerning the visits. Meanwhile, as planed Col. Shahriar tendered his resignation and left his post and got into man power business. He opened a travel agency and recruiting office. 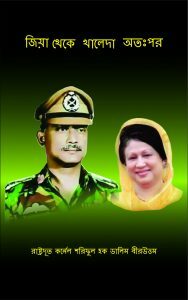 Later Maj. Huda resigned sighting domestic reason and joined the business with Col. Shahriar.